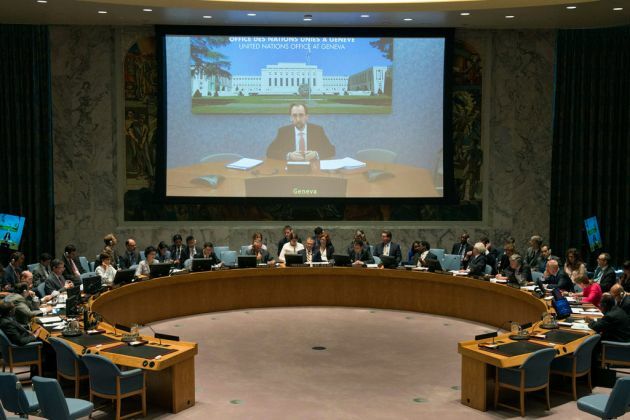 (Photo: UN Photo / Eskinder Debebe)UN High Commissioner for Human Rights, Zeid Ra'ad Al Hussein, briefs the Security Council. There is increasing talk in the world today of departures from institutions and laws which States built to codify their behavior, the U.N. human rights chief has said, warning "hate speech" precedes violence. U.N. High Commissioner for Human Rights, Zeid Ra'ad Al Hussein, opened the 31st session of the Human Rights Council in Geneva, Feb. 29. "When leaders express, or ignite, waves of hate speech, as we have seen in recent months – hate speech against migrants, and specific ethnic and religious groups – they are setting off shock-waves, whose impact will lead to violence," warned Zeid. The speech had elements that could have been aimed at the UK, which is debating whether or not to leave the European Union and the United States which has presidential hopeful Donald Trump who wants to raise walls to keep out migrants from Mexico as well as Muslims. The U.N. high commissioner asserted that, "Gross violations of international human rights law - which clearly will lead to disastrous outcomes – are being greeted with indifference," that undermine the U.N. Charter to which virtually every nation subscribes. "More and more States appear to believe that the legal architecture of the international system is a menu from which they can pick and choose - trashing what appears to be inconvenient in the short term." Zeid noted that human rights violations are like a signal, the sharp zig-zag lines of a seismograph flashing out warnings of a coming earthquake. "Today, these jagged red lines are shuddering faster and higher. They signal increasing, and severe, violations of fundamental rights and principles. "These shocks are being generated by poor decisions, unprincipled and often criminal actions, and narrow, short-term, over-simplified approaches to complex questions," he said. The high commissioner said such outcomes are crushing the hopes and lives of countless people. "This resurgent broad-based malice, irresponsibility and sometimes eye-watering stupidity, altogether acting like steam at high pressure being fed into the closed chamber of world events." Zeid warned that unless it is released gradually and soon with wiser policy-making in the interests of all humans instead of the narrowest, purely national, or ideological, agenda, its release "when it comes, will be as a colossus of violence and death." He noted that the haphazard undoing of a system of law and values that States themselves instituted to foil global threats "is deeply alarming." Zeid said, "Many leaders are pandering to a simplistic nationalism, which mirrors the simplified and destructive 'us' versus 'them' mind-set of the extremists, and fans a rising wind of prejudice and fear. "This bid to find unilateral quick fixes for issues that have broad roots is not only unprincipled, it is illusory – and it contributes to great suffering and escalating disarray." The U.N. rights chief also noted that while civilians have to endure frightful attacks it is not the only armed conflict where this is happening. "Multiple medical facilities, religious sites and schools have been repeatedly attacked and bombed in Afghanistan, Iraq, Libya, South Sudan, and Yemen. "The damage done by these violations - in bloodshed, and needless suffering and deaths from treatable illnesses and wounds - is dreadful. I add my voice to that of the distinguished President of Médecins Sans Frontières: the normalization of such attacks is intolerable."